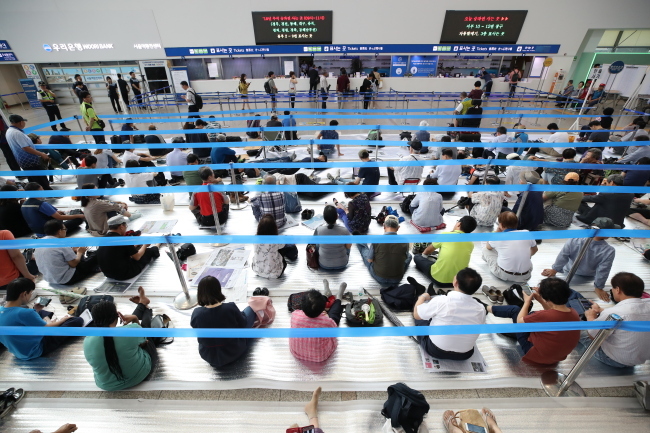 KTX bullet train tickets for the Chuseok holiday period to most cities in the southern part of the country opened early Tuesday morning, but sold out almost instantly. On that morning, Lee Ja-yoon set her alarm for 6:30 a.m., an hour before her usual wake-up time. The 27-year-old office worker, who lives in Seoul but is originally from Busan, has grown accustomed to the annual ritual of reserving round-trip train tickets online ahead of Chuseok, but even after three years she still feels her stomach clench as she sits in front of her laptop waiting for ticket sales to open. Just in case her laptop’s built-in digital clock is wrong, Lee has another online clock open on a separate screen. Her palms are wet with perspiration as she signs in to the Korail website, browses, and tries to figure out which of several train itineraries best fits her work schedule. Serenity sets in at 6:59 a.m., and Lee quietly watches the seconds go by in the countdown to 7 a.m.
With confidence and speed, Lee dexterously moves her mouse and madly clicks away in what Koreans call “gwangcle,” clicking one’s mouse in a fervid attempt to reserve something online. Her first-choice tickets are already gone within seconds, but she manages to acquire seats on the KTX bullet train at manageable departure times. With the morning drama done, Lee gets ready for another day at work. As a young worker who has left her hometown to work in the capital city, Lee is not alone in the endeavor to make a trip home on national holidays such as Chuseok and Seollal. Some of Lee’s friends even make an early-morning trip to the neighborhood’s 24-hour internet cafes, or PC rooms, where the computers have faster broadband connections, to raise the chances of getting tickets with their preferred departure times. Highway congestion for the national holiday exodus out of Seoul is unpleasant, and the KTX bullet train provides a much more desirable mode of travel. On Tuesday, tickets opened for cities on the Gyeongbu, Gyeongjeon, Donghae, Daegu, Chungbuk, Gyeongui, Gyeongwon, Gyeongbuk and Donghaenambu lines. Tickets will open Wednesday at 7 a.m. for cities on the Honam, Jeolla, Gangneung, Janghang, Jungang, Taebaek, Yeongdong and Gyeongchun lines. This year, Chuseok, which follows the lunar calendar, falls Sept. 23 through 25. Any remaining or canceled seats can be purchased after 4 p.m. on Wednesday. Train tickets can also be purchased at designated physical locations such as Seoul Station, starting at 9 a.m.